eG Enterprise supports monitoring any type of server (including rack server, blade server, tower server, etc.) across a wide range of vendors such as HP, Dell, BMC, Cisco, and more. Remotely remediate server issues with automated control actions – terminate runaway processes, start/stop services, reboot servers, etc. 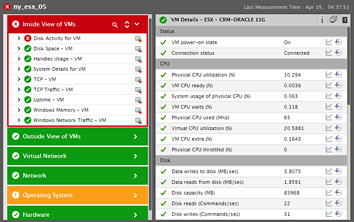 You can also track key virtualization metrics such as memory swap, memory ballooning, VM CPU ready, under-provisioned and over-provisioned VMs, etc. 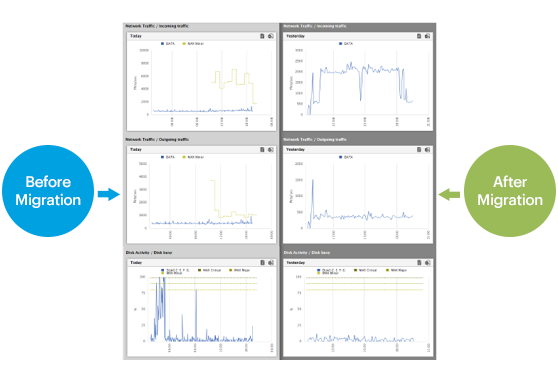 Built-in capacity planning reports help forecast how many more VMs may be added to your infrastructure, right-sizing your virtual infrastructure to do more with less. Out of the box, eG Enterprise supports monitoring server virtualization technologies (such as VMware vSphere, Microsoft Hyper-V, Citrix XenServer, Nutanix Acropolis, Linux KVM, Red Hat Virtualization, etc.) and desktop and application virtualization technologies (such as Citrix XenApp, XenDesktop, and VMware Horizon). 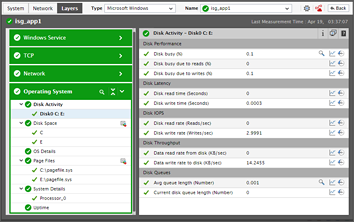 Easily detect storage bottlenecks in external SAN and NAS arrays that affect application and server performance. eG Enterprise supports monitoring over 20 storage devices including EMC, NetApp, Dell, Hitachi, HPE, and more. 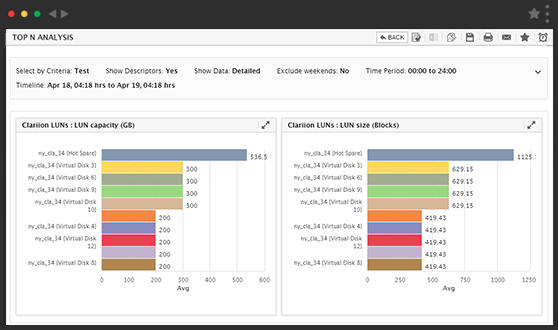 Get alerted to storage performance issues within your SAN arrays, LUNs, storage pools/RAID groups, etc. 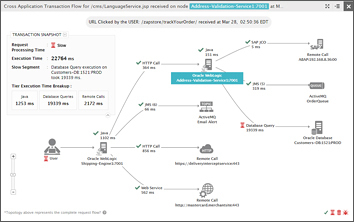 eG Enterprise’s network-aware application visibility provides correlated insight to help administrators easily identify if slow network connectivity is impacting application performance. 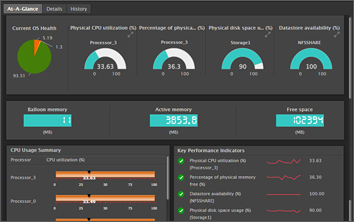 In addition to monitoring on-premises infrastructures, eG Enterprise provide native monitoring support for cloud environments (SaaS, PaaS, IaaS). 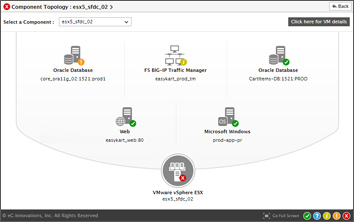 eG Enterprise is available in both on-premises and SaaS deployment models. 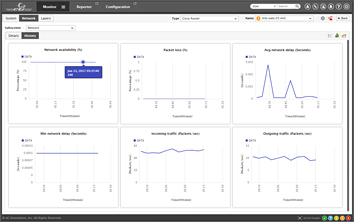 Monitor all your business-critical applications from a single web-based console. 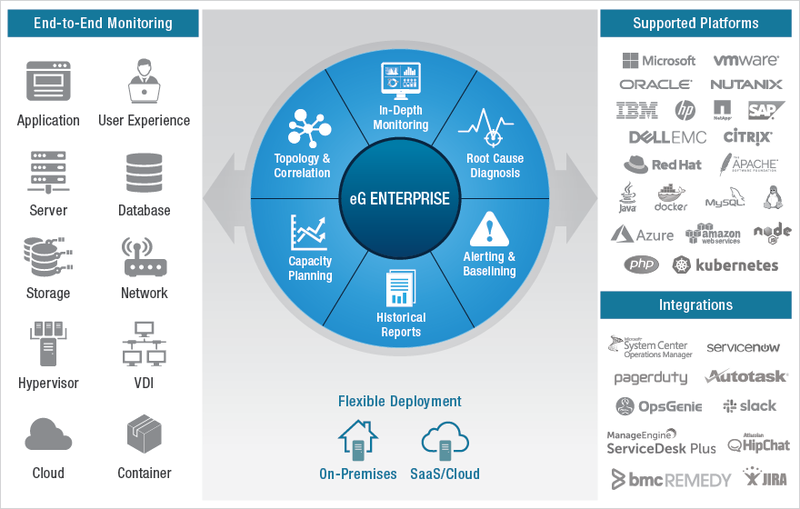 eG Enterprise delivers purpose-built monitoring models for enterprise applications (SAP, PeopleSoft, Siebel, Microsoft Dynamics), web applications (Java, .NET), VDI (Citrix, VMware), SaaS applications, and more. Eliminate disagreement and blame between IT teams: Network, systems, virtual, storage, helpdesk, etc.